Above is an HDR photo I took last summer (2010) in the historical center of Rome. While I could name it something fancy and quite useless like "Kid on Cobblestones" - drawing attention to the kid walking behind the car - all the attention should and has to go to the Alpha Romeo, the car in the forefront. Rome is literally littered with these government cars - also known as Blue Cars or "Auto Blu." You really cant throw a stone without hitting 3 of them, and cant cross a road without risking being hit by one. 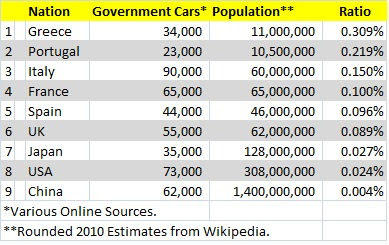 The numbers are quite daunting: based on Omniauto: in 2010 there are 629,120 of these government cars circulating. 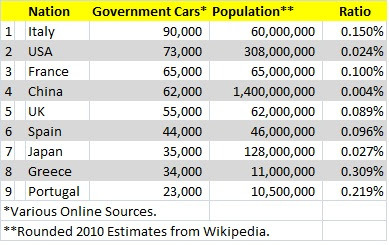 Wikipedia's estimate of Italy's 2010 population is 60,642,308 people, meaning that THERE IS A NUMBER OF GOVERNMENT CARS EQUAL TO FREAKING 1 PERCENT OF THE GENERAL ITALIAN POPULATION!!!! Ok... to this we can only say...WTF??? So a bit more digging around gets us to other estimates: Autoblog says 574K, EF's journalist site sticks with 608K - but it seems that "more official" numbers put the actual estimate at somewhere between 90K and 100K, as the +600K number might be including cars like ambulances, cop cars, etc. Italy is the worst ranking of the considered countries, but ends up 3rd after Greece and Portugal when evaluating against the Car/Population ratio. Wow - Italy is at least only third on this crap chart (which sees China, USA and Japan as the most frugal). That said, being just behind Greece and Portugal is not good news, even cause of all the great headlines such countries have made over the last year (link, link)... Not that the US is in better shape currently. If you think: "hey 90K cars" is not that much. Think of the cost for gasoline, the drivers, the toll roads (all freeways in Italy are toll based), circulation taxes, insurances, etc... currently estimated in Italy at 21 billion euros a year (ndr, it is still unclear if this is for the 600K number or the 90K number, if the former is the case, then it would be some 3.5 billion euros for the latter... still NUTS). Shot with my Nikon D90 around 3PM in June. Layered in Photoshop to fix final ghosting issues - see a more detailed example here. Non ronin quoted articles: here, here, here, here and here.